Although every season has special moments that create lasting memories. One that sticks out the most was in 2007 when I stood on the top of the podium, at the Pan Am Games, and heard O’ Canada. That experience brought tears to my eyes and has instilled a desire to hear it again. It is that memory that helps me to train harder and drives me to be better! Pain is temporary, it may last a minute, an hour, a day or a year. If I give up however, it lasts forever. With the support of CAN Fund I am able to dream big and chase after my dreams without worrying about the cost of living and training. Thank you for believing in the potential of Canadian Athletes!!! 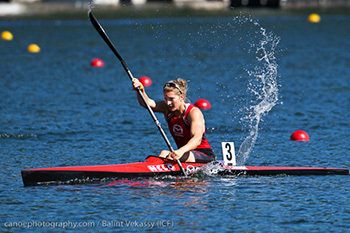 3rd in the 4x K-1 200m Relay at the 2009 World Championships in Dartmouth, Nova Scotia. I love to go puddle jumping, especially with my 5 year old sister!! !